And, God Bless the Stonewall Veterans! 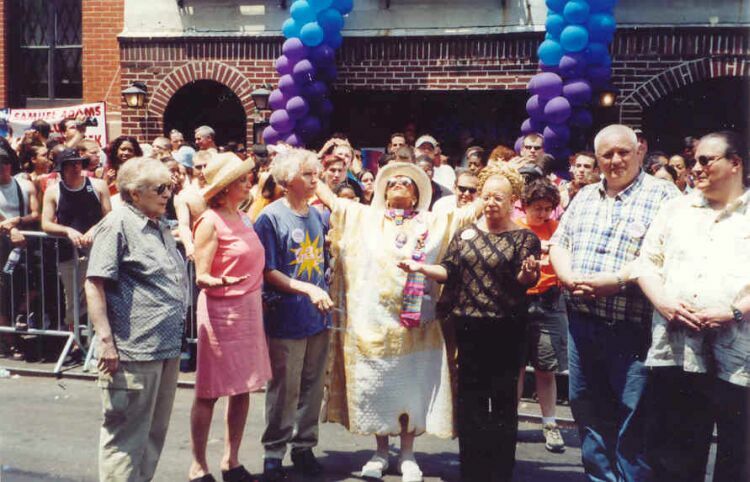 Reverend Magora E. Kennedy (center) in action on "Sunnyday", June 30, 2002, with both arms thrown up to the heavens, joined by fellow Stonewall veterans and a congresswoman (l-2-r): Rose Giordano, S.V.A. Executive Committee; Williamson Henderson, S.V.A. Director; U.S. Congressmember Carolyn J. Maloney, S.V.A. Honorary Chairperson; Cristina Hayworth, S.V.A. Ambassadress; Jeremiah Newton, S.V.A. President; and Bert Coffman, S.V.A. Vice-President. This is the scene of the annual "Stonewall Prayer" in front of The Stonewall Club on Christopher Street at Stonewall Place in Greenwich Village during the annual New York City Gay, Lesbian, Bisexual and Transgender ("GLBT") Pride Parade. You can see the full, respectful and attentive crowd -- except one (an intrusive HOP-er in orange t-shirt) -- looking at and listening to the "Gay Rev". Many other veterans of the 1969 Stonewall Rebellion, completing the circle, are not shown. The Gay Reverend Magora E. Kennedy is 100% New York State -- suburban and urban. Rev. Magora was born in Albany, New York, the state capital, on September 22, 1938 (one of our elder Stonewall veterans, raised in Saratoga Springs (upstate NY) and has lived in New York City the past few decades in Manhattan and Brooklyn and has been residing in The Bronx since the mid-1990s. "Gaygora", her S.V.A. nickname created by Williamson, is the mother of five, the grandmother of ten and the greatgrandmother of five. Is this unusual? Absolutely! "How-be-ever" (a Magora witicism), way back then, women were 'expected' to get married -- and to a man. In Rev. Magora's situation, she was "under extremely heavy, forced, emotionally tormented pressure". Make no mistake -- Rev. Magora dearly loves all of her blessed twenty offspring! Because of her big clan, that's why she is known as the "Gayest Great Grandmama". Rev. Magora -- with her minister's collar on -- was there the very first night of the Stonewall Rebellion on Friday, June 27, 1969. In the daytime, Magora and several friends paid their respects at the funeral of the great, color-less entertainer Judy Garland at her huge public funeral in the Upper East Side of Manhattan. Four Gay women were driving out of Manhattan, after an evening of food and drink in Greenwich Village, New York City, that very hot Friday night headed to Provincetown ("P-town"), Rhode Island. They all had been talking about the great career and short life of Gay icon Judy (47) all the while listening to the a.m. radio in Magora's car. Magora was driving. Rev. Magora explains how they hadn't driven very far, still in Manhattan, when they heard a brief item on the local news that: "This just in! An uprising in Greenwich Village had just broken out at The Stonewall Bar involving the police". Surprised but not shocked, Magora relates, "After hearing this scarey news, we turned around lickity split and headed right back to The Village. When we arrived on Christopher Street, the cops, of course, already were in full mode and had some people in a police paddy wagon. There were still more GLBT patrons inside. They were slowly parading some other Gay people out the front door of the Stonewall Club." Colors of the Rainbow: Rev. Magora in Red! 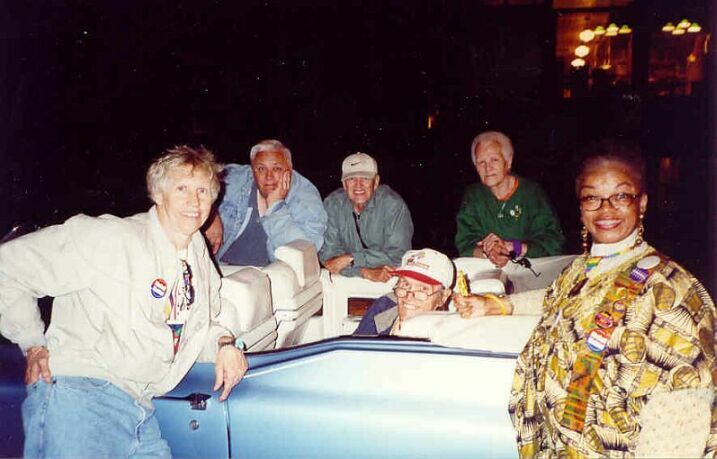 Sitting across the top of the 1969 blue "Stonewall Car" back seat are (l-2-r): Dianne Yodice (in blue and indigo); Chyna Fucito (in yellow and orange); and the Gayest Grandmama Rev. Magora Kennedy (in red and red), smiling proudly. Driving the "SW-Car" is Ray McCaffrey (adjusting his shades) and ridin' shotgun is Amir Qaharr (not adjusting his). To the right rear is Will Weder (in all white). The rainbow Gay Pride flag, waving proudly, displays all the colors with the Rev's red on top. "This scene in 1969 was incredible -- like in an alarming movie. I personally witnessed this one Gay boy who was marched out of The Stonewall Club, by what turned out to be plain-clothes cops. The boy actually tried to escape and nearly escaped but was grabbed from behind, pulled to the ground outfront The Stonewall and then he was needlessly drop-kicked by a big uniformed cop. The boy's nose must have hit the pavement because he was suddenly bleeding. His standing up to this police abuse against Gays sho' nuff sparked the rebellion. That scene was just too much for the growing and angry crowd of every type person you could imagine. My friends and I observed a couple of cops take Williamson Henderson, though I didn't know him or his name then, off to a black and dark green cop car and did a little billy-clubbing along the way. I really feared for Williamson's life, though I was in a circle of fear myself. In 1969, those things actually happened", Reverend Magora reflected. "The beautiful, blue convertible 1969 Cadillac "Stonewall Car", an easily remembered fixture in front of The Stonewall Club -- the car I did know -- was parked a couple of doors up from The Stonewall near Seventh Avenue South. It suddenly was in the middle of everything. A uniformed cop was yelling to "Get that car out of here!" I recall a man got in the car, who we later found out was a plain-clothes cop, and then another one jumped in right over the side of the car. He didn't even open the door. He must have been plain-clothes too. After a path through the growing crowd was cleared for them, they actually drove the car slowly out of Christopher Street amidst loud 'hoots 'n' howls'. It turns out that they took the car, which they considered their trophy of the Stonewall Rebellion, over to the local Greenwich Village police precinct. We found out that the next day and evening, many cops were actually posing with the car for photo-ops. Years later this was further confirmed by some Gay police officers who heard the details of the capture of the car on their police radios." The Gay Reverend delights in proclaiming that: "Thank God Almighty that the times they have sho 'nuff changed y'all because since the glorious Stonewall-25, the 'Stonewall Car' has been on display at New York Police Headquarters as part of the tribute to Gay Pride Month". In fact, every year at the N.Y.C. Gay Pride Parade, we have endless police officers who actually smile when they see the famous car and give us SVA-ers the thumbs-up. They all know the symbolic history of the 'Stonewall Car' and admire our possession of that traveling symbol of Gay Pride." Continuing on about her eyewitness account of the historic 1969 Stonewall Rebellion, in a recent interview, the lively Gay Rev recollected: "After awhile, as the excitement and the crowds continued to grow and get louder and feistier, I saw this big, good-looking, black drag queen, with a fancy blue cocktail dress and some sparkly high heel shoes, yank loose a street parking meter "with a little help from her friends". Funny, that was a sing-a-long song by The Beatles at The Stonewall a couple of years earlier. Anyway, as anyone who was ever there or ever travelled that block knows, there was street parking there then. At this point with the turning of the tables, many of the cops were now barricaded inside The Stonewall Club and we were all on the outside! What a change of events that was. The 'black 'n' blue' drag queen -- without a green light -- and her newfound, very Gay rebellious friends began to batter The Stonewall's door with the uprooted parking meter and bang on the front door of The Stonewall but nobody in the 'inn' was answering. Hello?! It wasn't too long before the cops called for some heavy duty reinforcements. They arrived in uniform, with helmets, armed, dangerous and on horses!" Rev. Magora Surrounded by Stonewall Vetz! Reverend Magora Kennedy (far right; in reality, far left) is shown with (l-2-r): Willson L. Henderson, S.V.A. Director; Jeremiah Newton, S.V.A. President; Ray McCaffrey, S.V.A. Financial Secretary; Terri Van Dyke, S.V.A. Treasurer (sitting in back seat); and Stormé DeLarverie, S.V.A. Ambassador -- and the blue 1969 convertible "Stonewall Car" -- after the Brooklyn Gay Pride Nighttime Parade on Saturday, June 8, 2002. Discussing Gay advocacy from the Stonewall Rebellion in late June and early July of 1969 to the Gay presence at the "Occupy Wall Street" in Manhattan, NYC, demonstrations in October and November of 2011, Reverend Magora Kennedy is interviewed on the scene in Lower Manhattan by the Washington (Gay) Blade. 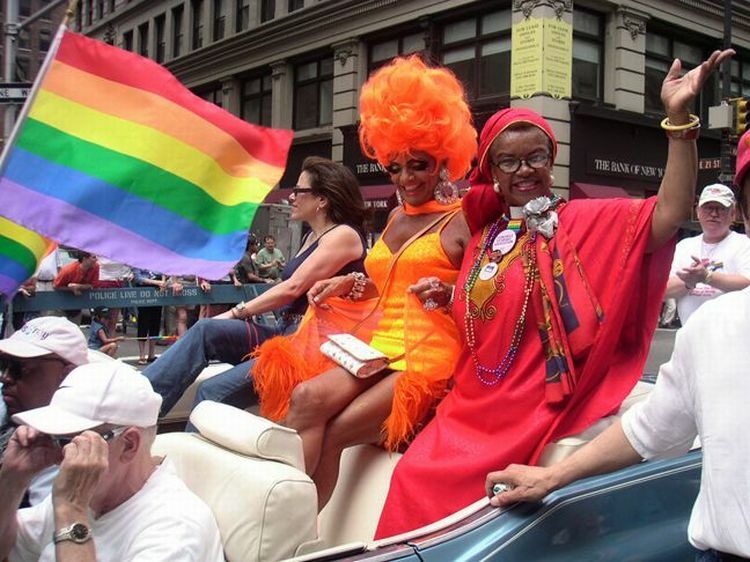 Reverend Magora Kennedy selected as the "Honorary March Leader of the Gay Human / Civil Rights Marches"
at S.V.A. Ambassador Storme DeLarverie's "Homecoming"!